Rias Baixas, pronounced "REE-yas BUY-shas," is located on a strip of land in northwest Spain called Galicia. It is one of the most difficult areas in the world to grow grapes. Yet one of the greatest white grapes in the world, Albarino, rises to perfection here like in no other locale. Galicia is rather cold and damp, probably the worst conditions for grapes; there isn't enough sun to ripen them, and the dampness produces mold and mildew. That suits Albarino just fine, as its thick skin is resistant to mold and the lazy sun allows the grapes to sit on the vine for almost a month longer than most varietals, creating incredible extraction and flavors. 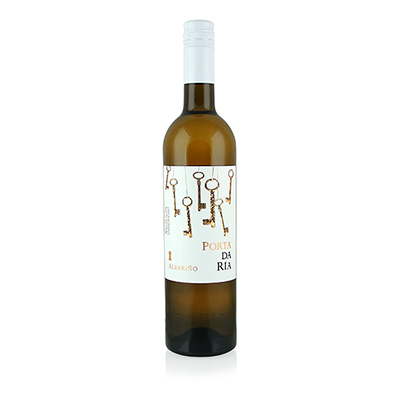 The Porta da Ria brand is crafted by Rectoral do Umia, an ultra-modern winery founded in 2009, which now produces some 80,000 cases per year. Over 90% of its production is Albarino. Winemakers have been seduced by this grape for decades, but very few have succeeded with it. My good friend, Bryan Babcock, spent 30 hours straight flying to Spain and driving to R?as Baixas to get cuttings of Albarino. He tried for years to get the same flavors as they get in this special spot, but failed. Those flavors are red apple and stone fruit mixed with a spice component bursting with cinnamon, cardamom, clove and allspice. The nose is a compendium of fresh cut flowers from rose petals to jasmine. The finish wallops you with all the previous sensations, leaving you lingering for more.